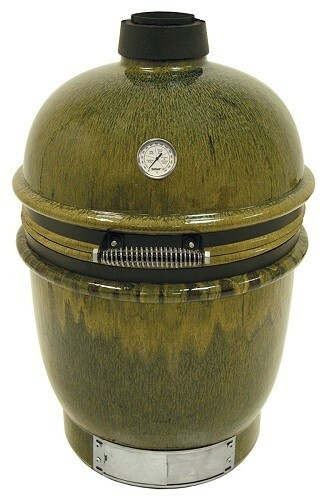 The Ceramic Grill from Bayou Classic is the perfect way to enjoy cooking outdoors. This uniquely styled grill also functions as a smoker. It features two adjustable air control vents which allow you to reach your desired cooking temperature, whether you are grilling, smoking, barbecuing, or baking. And because this grill is made of ceramic, it will easily retain heat and maintain the appropriate temperature. The Ceramic Grill also features cool touch handles, side shelves, cart with locking casters, grill cover, a unique cypress leaf finish, and a 18.5" stainless steel cooking grate.